Nine former UCLA football players will participate in the NFL Scouting Combine later this month, by far the largest total of Jim Mora’s four-year tenure. Linebacker Myles Jack, a likely first-round draft pick, leads a group that also includes: defensive tackle Kenny Clark; kicker Ka’imi Fairbairn; running back Paul Perkins; receivers Jordan Payton and Thomas Duarte; and offensive linemen Jake Brendel, Caleb Benenoch and Alex Redmond. Ohio State and Notre Dame are the only college teams with more players set to appear at Lucas Oil Stadium in Indianapolis, with 14 and 10, respectively. Defending national champion Alabama will also send nine players to the Feb. 23-29 event. 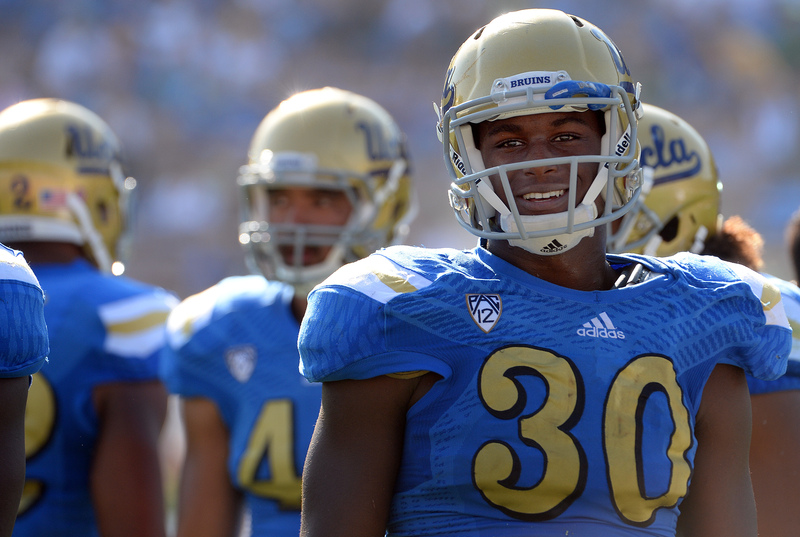 UCLA had five participants in each of the last two NFL combines, and six in 2013. Only one Bruin, tight end Cory Harkey, was invited to the 2012 combine. UCLA offensive lineman Alex Redmond has left the team and signed with an NFL agent, head coach Jim Mora said Tuesday. The junior had been a mainstay on the Bruins’ offensive line ever since he arrived in 2013 as four-star recruit. He started all 13 games at right guard his first season, and was named a Freshman All-American. He started eight games in 2014, and 10 this fall. The 6-foot-5, 305-pound Redmond will likely risk going undrafted. His departure leaves the Bruins very thin at guard heading into Saturday’s kickoff against Nebraska in the Foster Farms Bowl. Redshirt sophomore Kenny Lacy is still limited with an ankle injury. Other options for the team are redshirt sophomore Poasi Moala and redshirt freshman Cristian Garcia. UCLA left tackle Conor McDermott is “very questionable” to play against Cal this Thursday after spraining his knee, head coach Jim Mora said Sunday. Arguably the best player on the Bruins’ offensive line, the 6-foot-9 redshirt junior missed the second half of this past Thursday’s 56-35 loss at Stanford. He was able to walk unassisted, but with a limp, after the game and had an MRI the next day. If McDermott doesn’t play, redshirt freshman Kolton Miller will be in line to make his first career start. UCLA’s 56-35 loss at Stanford last night exposed even more of the Bruins’ flaws. The game story is here, and below are some more thoughts on what happened at Stanford Stadium. 1. Was this UCLA’s worst loss under Jim Mora? The game ended less than 24 hours ago, so there’s certainly some temporal bias to account for here. Still, I don’t remember seeing an uglier outing by these Bruins. The 49-26 loss to Baylor in the 2012 Holiday Bowl would be at the top of the conversation, but that — like losses to then-unranked Oregon State and Cal the same year — can be chalked up in part to first-season growing pains. Back-to-back losses to Stanford and Oregon in 2013 were thought of as part of UCLA’s developmental process. But Thursday night? That felt more damning, another brick in the wall keeping the Bruins on the side of “good” rather than “great” — the side of nine-win seasons rather than playoff berths. UCLA’s eight-game losing streak to the Cardinal is now its longest to any opponent, surpassing the Bruins’ seven straight losses to USC from 1997 1999-2005. Losing 31-10 at the Rose Bowl last year, when Stanford had a down season, stands as a major missed opportunity to get over the hump. » UCLA’s live scrimmage on Friday evening was its final practice at Cal State San Bernardino. For anyone planning to come out to the Inland Empire on Saturday, the Bruins will be out at 9:15 a.m. for its “Fan Appreciation” event. Players will sign autographs, and free food will be available from a Stater Bros. trailer. » The live scrimmage itself was a bit of a mixed bag. The first-team offense and defense combined as the blue team (coached by Taylor Mazzone), facing off against the rest of the Bruins on the white team (Noel Mazzone). But taking into account injuries and some liberal substitution patterns, it wasn’t exactly an accurate simulation of how the two sides stack up.